The worst tragic accident happened in the mountain of eastern Algeria. The C-130 Hercules transport plane boarding the Algerian armed forces and their love ones when it crashes and killing 77 people. Algerian media initial reports said that the death toll is 103. But the Defence Ministry cleared and said that 77 people were killed in the plane crash. Government official told Reuters by telephone that "the plane crashed into a mountain and exploded. Several bodies were burnt to ashes and could not be identified." The reason behind of the accident was due to bad weather, according to the Algerian Defence Ministry. For the meantime, please bookmark it now or visit this site more often for you to be updated. 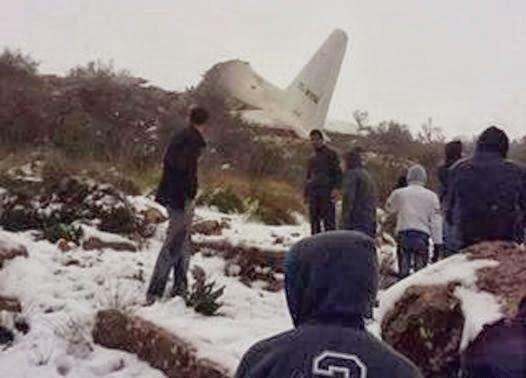 You may also share this post to your friends so they may know about plane crash in Algeria. Comments or suggestions about "Plane crash in Algeria leaves 77 dead people" is important to us, you may share it by using the comment box below.